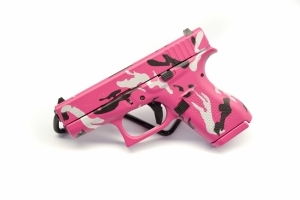 This is a Glock 42 9 mm in a three color Pink woodland camo theme. 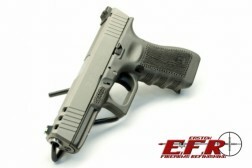 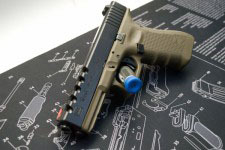 Glock 22 in a nice two tone look with the grip inserts coated Graphite Black. 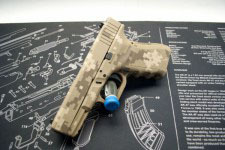 We stippled the grip on this glock frame for one of our regulars. 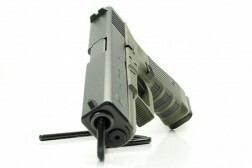 He uses this and his other glocks for IDPA and Stippling is much more reliable than the grip tape he was using. 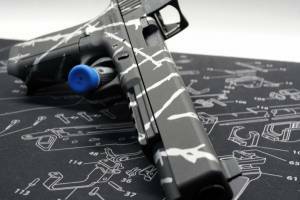 We've started Stippling, This is the first crosshatch one we tried. 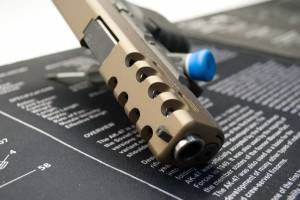 Afterwards we ordered a "comb" and some other tools to ensure a more consistent look in the future on more complex patterns. 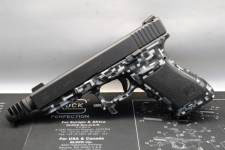 This is another Glock 24, This one was done to match the customer's 2 other Glocks in custom camos. 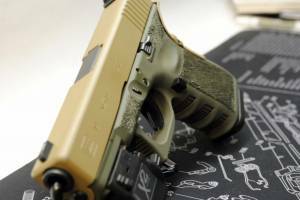 This glock is refinished in a digital camo theme in coyote tan, patriot brown and desert sand. 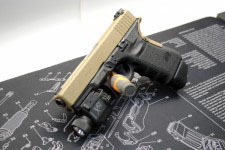 This Glock 20 has a KKM Presion stainless barrel and heavy tungsten guide rod assembly, extended mag release and slide stop, Topped off with Ameriglo fiber optic sights and a Lonewolf muzzle brake to tame the recoil. 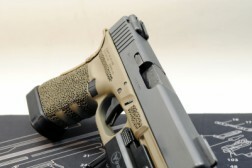 A blast to shoot with talon grip tape to allow for a firmer grip. 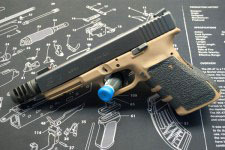 This is a Glock 17 with a custom milled slide that was coated in Graphite black on the slide and Patriot brown on the frame. 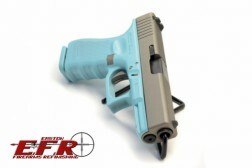 Just the slide was refinished on this one. 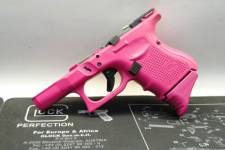 This G27 glock frame is refinished in Sig Pink for a young lady. 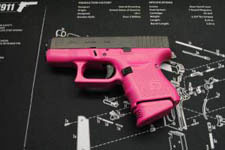 This Glock Frame was done in Prison Pink.